Alipay — "Center of Corporate Technologies"
M4Bank.AP is a full-featured, technology-based AliPay payment processing solution created by Center of Corporate Technologies based on M4Bank.MPOS solution. The system allows the Customer to make an in-house connection to the payment system AliPay in a short time and to organize technological interaction for processing transactions. AliPay offline payment gateway for receiving files with calculations and processing transactions with points of sales. SOLUTION HAS ALREADY BEEN TESTED AND IS IMPLEMENTED WITHIN THE TERRITORY OF THE RUSSIAN FEDERATION. According to the Better Than Cash Alliance, the payment system has broken all records: users sent $1.7 trillion in total payments through Alipay service. The Chinese service has far outpaced PayPal’s (197 million users) payment volume, which in the same year amounted to 354 billion U.S. dollars (about 16 million transfers per day). 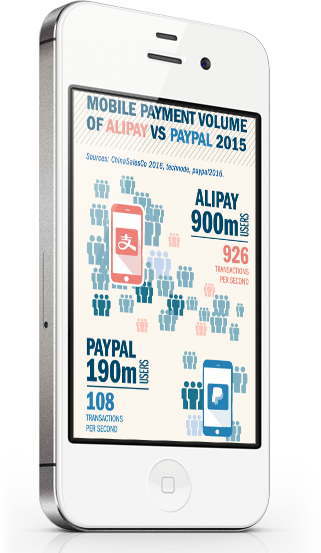 Alipay has over 450,000,000 users in China. Primarily, the citizens who are traveling are the active users. More than 1.3 million Chinese tourists visited Russia in 2016. 40% growth in comparison with year 2015. Often, Chinese tourists do not have bank cards, but have Alipay wallets.